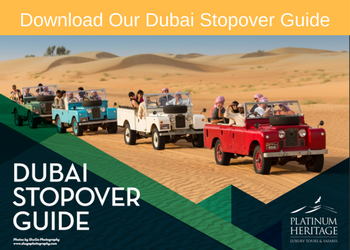 With World Responsible Tourism Day coming up on November 5th, the Travel Team of DubaiEye are joined by Platinum Heritage’s Managing Director Adam McEwan, for a chat about the desert safari tour operator’s plans to help UAE students learn more about the issue. MARK: We’re going to uncover the delights of the desert as we look forward to World Responsible Tourism Day which is coming up on November the 5th. And it’s a real pleasure to have joining us Adam McEwan from Platinum Heritage in the studio. Great to see you again Adam. ADAM: Yeah, it’s becoming a habit now. ADAM: So thank you very much for having me back on again. LUCY: It’s our pleasure and it is because of course you guys are one of the partners of the initiative here in the UA taking part in World Responsible Tourism Day. Just tell us a little bit about the day and what’s going on here in the Emirates? ADAM: Sure. Well the United Nations are actually into the 11th year now since they started Word Responsible Tourism Day as a way of recognising how important tourism operators are to showcasing local conservation. And that’s not just environmental conservation, but also protecting local culture, heritage and communities. 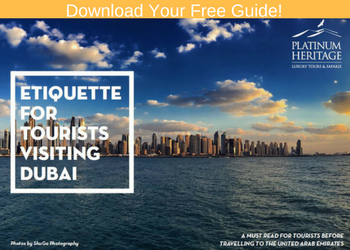 We are now very, very proud to be the only sponsor in the UAE to ever be an official supporter, so we can go out and really try our best to educate everyone about responsible tourism. MARK: And of course education starts with youngsters doesn’t it. That’s kind of what you’re targeting really. You’re going to be taking those youngsters and showing them the desert and showing them how to take care of it. ADAM: Yeah, we’re very, very happy to be partnered with Jumeirah College this year. We have 150 students from their grade 8 class coming out to visit us. And during the day we’re going to do a voluntary clean up day. We’re going to be cleaning the perimeter area around the Dubai Desert Conservation Reserve. That’s the rubbish that can sometimes fly over the fence especially if we have rain like last night. ADAM: And unfortunately animals like gazelles and oryx can ingest those and it has deadly consequences. Even outside the reserve with camels; we have a lot of camels unfortunately passing away because of ingesting old bottles and rubbish. So the kids are coming out to try and help clean up the desert and in the process we’re also going to educate them about some responsible tourism practices in the desert. And we’re also going to teach them some of the local cultures and some of the heritage items as well. LUCY: Yeah. You’re going to be showcasing some lovely cultural and I suppose heritage elements of the UAE. Tell us a little bit about that? ADAM: Well I think it’s very important to have a hands on approach not just with students, but with everyone. So we’re going to bring falcons out, we’re going to teach the kids falconry and show them that cultural connection and why it’s important. We’re going to have Emirati food so they’re going to try and sample some Emirati dishes maybe for the first time. We’re going to have old bread makers out from the communities come out and cook bread in a very traditional way. We’ll have henna ladies out there doing the traditional style, Arabic style henna. So we’re really going to try to bind all this together. We also have some great performers that do a yola dance; yola is a very traditional dance where the gentleman swing guns around. Unfortunately in the desert safari industry there’s a lot of things that aren’t part of the culture here and it’s really sad when students go out or when tourists come out and they see things like tanoura dancing, belly dancing and have a curry. All things that are great, but it’s not part of the culture here so we really want to try and teach the students about what’s authentic, what’s really from here and I think it’s important to start from that young age. MARK: And when it comes to desert conservation what kind of messages are you going to hopefully get across to these youngsters? And what are the big mistakes that people make when they go out in the desert? Because I know you’re super passionate about this. ADAM: We are. Well the number one thing and most people do it accidentally, they don’t know that they’re doing it, they don’t know that they’re doing damage, is dune bashing. Very, very popular past time in this part of the world and everyone quite innocently I think, I hope, believes that it’s fine. That it’s just empty desert, it’s empty sand and they’re not doing any harm. Unfortunately the opposite is true. The desert eco system is very sensitive so when you’re driving fast across dunes you’re filling in these small little pockets where vegetation thrives, you cover that up with sand you’re covering up the habitat for subterranean animals, all of the insects and all of the reptiles and they don’t have a home anymore. So you end up with whole deserted areas. Places that are very popular in the tourism trail like Big Red and Fossil Rock you just don’t see any vegetation and where there’s no vegetation there’s no animals. About 95% of the animals in the desert live under the desert sand so you don’t see it. So a lot of people because they can’t see it they don’t think it’s there and it’s really sad. So we’re trying to educate the market that dune bashing isn’t this innocent thing, it’s an adventure sport and it should be limited to certain areas because it does a lot of damage. LUCY: With regards to the tour operators here, the tourism industry here in the UA I mean how aware are people nowadays about the need for responsible tourism and what do you think could be done perhaps by the local market itself, perhaps by the local market itself, perhaps by the government to improve matters? ADAM: I think the responsibility is the individual tour operators themselves. I really don’t believe that the government needs to step in and try and regulate and police. I think it needs to be again, education. People understanding that it’s doing some damage and I think that’s what’s really lacking in the market. People that don’t know they are doing damage and had they known that what they’re doing is contributing to something that’s damaging the environment or maybe even leading to extinction they definitely wouldn’t do it. I just don’t think people know, which is why something like World Responsible Tourism Day gives us a platform to educate people that what they’re doing innocently is actually doing a lot of damage. LUCY: Be interesting to see though whether they did bring, I mean there’s the tour company issue there’s also private vehicles or people that go out in groups I suppose it would be really good to have as you said kind of designated areas for that kind of adventure sport angle. ADAM: Well areas like Big Red and Fossil Rock unfortunately, we’ve been speaking to conservationists the lot, they’re so badly damaged it would take decades and decades to try and repair again. And it goes against the whole conservation message that I guess us in the industry are trying to obtain which is trying to get to the point where we can actually relocate animals like oryx and gazelles and let them out into the open desert and to thrive. But unfortunately a lot of things have to happen first and there has to be a lack of rubbish. And we all know if we go out on an individual drive or picnic we know that there’s a lot of rubbish in the desert and we can’t really release these animals until that rubbish has gone. We can’t release these animals if their habitat’s going to be destroyed by people driving over their dunes. So there’s got to be a lot of education in place so that people can drive responsibly like in African style safari. You go on these beautiful African safaris over the plains and over these savannas, you do it gently, you do it respectfully. The guides will know where the breeding areas are and they stay clear of it. We need to do the same here, we need to kind of limit dune bashing to maybe an area and really focus more on the animals we have here, the plant life and the cultural connection that the Bedouin had to the land. The medicinal purposes they would use the plants for, the food or how they would construct their shelters to survive. MARK: Are there any species that are kind of close to extinction because of us humans going out there and doing all the things that we do in the desert? ADAM: Yeah, there’s a lot that we’re watching at the moment. There’s one gecko actually, a small little gecko that’s native to the deserts of Dubai that’s right on the brink of extinction. So we’re trying to help. Every guest that comes out we donate towards conservation because we’re really trying to I guess finance an attack against all this so we can try and protect these animals. And it might not sound like much, but it’s one gecko today it’s a lizard tomorrow it’s a bird the next week until eventually everything’s gone. And that’s what we want to try and do and that’s what our guests look for and that’s hopefully what the students will take from this. That when you go out to the desert you want to leave it just that little bit better than when you found it. Not that little bit worse. LUCY: It’s a lovely ethos definitely and we wish you the best of luck with your efforts on World Responsible Tourism Day. Thank you so much for speaking to us.